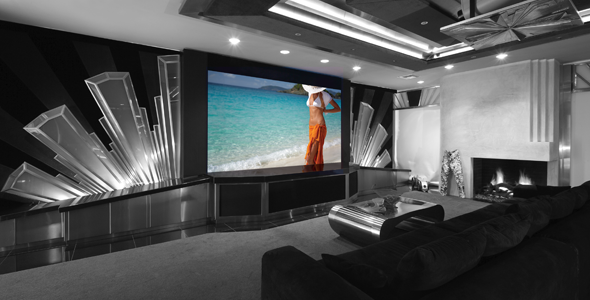 The magic of home theater is based on the suspension of disbelief; that moment when the viewer is totally immersed in an audio/video experience, when sound and image work seamlessly. This challenge drove the development of Screen Research's patented ClearPix™ screen fabric. Ideally, with the large images possible with a projection screen, loudspeakers need to be placed behind the screen. This presents obvious problems. A conventional solution is to micro-perforate the screen and apply acoustic correction to the audio signal. With the advent of fixed pixel projectors, the regular pattern of holes in the screen can coincide with the image matrix, creating a disturbing visual effect, moiré. ClearPix™ fabrics solve both of these issues in one fabric. The fabric's woven construction avoids moiré and provides an acoustically transparent structure with minimal insertion loss and no need for acoustic correction. At the same time, ClearPix™ fabrics maintain perfect color balance and a uniform white field, with no hot spots for the ultimate video performance. Such are the performance levels of ClearPix™ fabrics for both audio and video that it is certified to both THX and ISF standards. Every THX Certified Projection Screen is tested to ensure that the optical properties do not impact the chrominance, luminance or uniformity of the projected image. THX analyzes the micro-perforations and screen materials to make sure that it is manufactured in such a way that it’s invisible to the eye when viewed from your seating position. This acoustically transparent material makes it possible to place the loudspeakers behind a THX Certified screen, allowing for a smooth sound experience in relation to the picture.